Psycho Solo Diver – Online Diving Blog and more!Working As A Diver | Psycho Solo Diver - Online Diving Blog and more! You are currently browsing the archives for the Working As A Diver category. Well, this was my second dive with the class, but the last dive for these students before they are either flunked or certified. This is Black Rock, Catalina. All the students were checked with a buoyancy test – I checked two students and they were slightly over weight – apparently that’s what the intent was. After floating around for about 10 minutes, all the students were in the water. We submerged, Crazy Ivan first, then the students, with me taking up the tail. Now it was navigation testing – basically, follow a compass heading out, then turn around and hopefully come back to the group. Crazy Ivan went with the students, I stayed with the group. Apparently, someone got lost as there was a big gap in time between when the testee left with Ivan and their return. Some students were swimming around, trying to keep warm, which did wonders for the immediate visibility. As the last couple of students were being tested, one of them approached 500 psi on air; I motioned everyone to the surface. Two students didn’t have enough air to continue, so they went back to the boat. The rest re-submerged with Ivan, with me taking up the rear, to continue the dive for five more minutes. Crazy Ivan debriefs his students. I have once again been called upon for my excellent skills as a safety diver – I am to help Crazy Ivan with his last two dives with his Open Water class and I get a free boat trip, free meals and a free last dive. 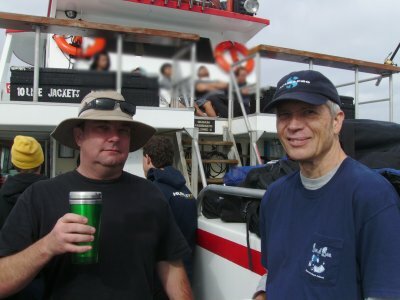 The original boat chartered was the Mr. C – the world renowned party SCUBA boat. For whatever strange reason, the Mr. C – “couldn’t get the compressor certified” and had to cancel – there are rumors that the Coast Guard won’t let it out on the ocean ever since it broke down at Catalina in April, and had to be towed and dry docked. The boat was switched to the Sand Dollar – this is the first time I’ve gone on this boat. Ivan had seven students – a little too many for him to keep an eye on alone. It was my job to do what I had done in previous years for Instructor John – keep the group together and handle any problems that I may observe. 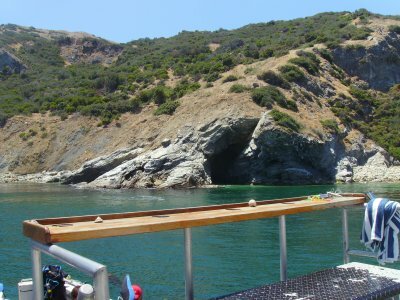 It took about two hours to reach Black Rock in Catalina; the boat was all students, class staff and four divers from Utah. I was the first to jump off the boat – I was getting hot and really had to take a leak. I floated for about 15 minutes while all of Ivan’s students jumped in and swam out to me. The first 30 minutes or so was surface skills – weight belt and BCD removal and replacement, then Ivan did the simulated emergency swimming ascent with all the students in pairs. The students, who are younger and lack the insulating fat that I have were getting really cold. I had to take one student back to the boat – he couldn’t get down because he had a cold and was too congested to equalize. All of us then descended and made our way back to the boat – a slow 20 minutes, with me taking up the rear of the line. One of the student’s tanks fell off the BCD – Ivan was able to remount the tank underwater with no incident.